CAPE CANAVERAL, Fla. (AP) — The crew of Discovery will squeeze in an extra inspection of the space shuttle late in its 12-day mission next month to make sure the vehicle is safe to return to Earth, NASA officials said Thursday. The first-of-its-kind late inspection, using a laser imager attached to a robotic arm, will be carried out on Day 10 of the mission while the shuttle is at the international space station. It will look for damage from tiny bits of meteors, said Tony Ceccacci, space shuttle flight director. The late inspection will be in addition to an intensive six-hour survey of the entire shuttle on the second day of the mission using an imager on a robotic boom. That inspection will look for damage during launch caused by ice, foam or even hits by birds. Flight engineer Jeff Williams on the space station also plans to photograph the underside of the shuttle as it does a flip before docking on the third day, and the fourth day has been reserved for a focused inspection on any areas of the shuttle that look suspicious. 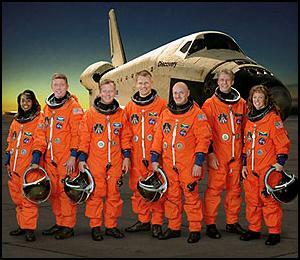 Discovery's launch, sometime between July 1 and July 19, will be only the second shuttle flight since the Columbia disaster in 2003. On that mission, foam from the external tank struck a wing, opening a gash that allowed fiery gases to shatter the spacecraft during re-entry. All seven astronauts were killed. Discovery's crew and NASA managers also said Thursday that they are optimistic they will be able to add an extra day in space for a third spacewalk by astronauts Piers Sellers and Mike Fossum, allowing them to test repair techniques on the space shuttle's thermal protection system. A decision will not be made until the crew is in space.